Made of 100 % Gray Wool, Fully-Lined to the waist with Black Muslin Cotton Single Breasted, 4 Row Braids, 9 CSA Buttons on Front, 2 CSA Buttons on the Back, Inside Pocket , Standup Collar. This Frock Coat is new and never worn. 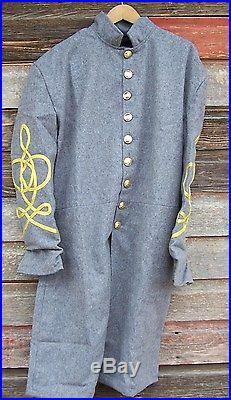 The item "Civil war confederate frock coat with 3 row braids 50" is in sale since Wednesday, August 16, 2017. This item is in the category "Collectibles\Militaria\Civil War (1861-65)\Reenactment & Reproductions\Uniforms". The seller is "flftp" and is located in Fort Laramie, Wyoming. This item can be shipped to United States, all countries in Europe, Canada, China, Mexico, Japan, Brazil, Australia, South Korea, Indonesia, Taiwan, South africa, Thailand, Hong Kong, Israel, New Zealand, Philippines, Singapore, Saudi arabia, United arab emirates, Qatar, Kuwait, Bahrain, Malaysia, Chile, Colombia, Costa rica, Dominican republic, Panama, Trinidad and tobago, Guatemala, El salvador, Honduras, Jamaica, Antigua and barbuda, Aruba, Belize, Dominica, Grenada, Saint kitts and nevis, Saint lucia, Montserrat, Turks and caicos islands, Barbados, Bangladesh, Bermuda, Brunei darussalam, Bolivia, Ecuador, Egypt, French guiana, Guadeloupe, Jordan, Cambodia, Cayman islands, Sri lanka, Macao, Martinique, Maldives, Nicaragua, Oman, Peru, Pakistan, Paraguay, Reunion.